The ratings agency Moody’s is continuing to assign a “negative” credit outlook to the University of Maryland Medical System. After UMMS purchased St. Joseph Medical Center in December 2012, the hospital was unable to receive Medicare certification and lost $14.8 million. The resulting loss of operating revenue was a factor that led to Moody’s placing the system’s debt rating on a “negative” credit outlook in February of 2013. On December 16, 2013, Moody’s continued their negative outlook of UMMS due to problems caused by the St. Joseph purchase and due to losses in operating, debt and balance sheet measures. In the latest report, Moody’s also identified that there is risk of “management distraction” due to the integration of so many new facilities. UMMS has added seven hospitals to the system in the last 10 years. In addition to these acquisitions, UMMS has planned significant capital improvements and, in some cases, entire hospitals are planned to replace existing facilities that UMMS has acquired. 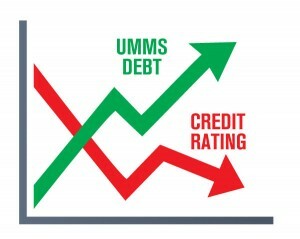 Moody’s indicated that unless UMMS improves its FY 2014 financial performance that it would face a downgrade. Notably, Moody’s also warned that an increase in debt could also lead to a downgrade. At the October meeting of the Maryland Health and Higher Educational Facilities Authority, UMMS executives sought approval to apply for $155 million in additional debt to fund the acquisition of the remaining 51 percent of the Upper Chesapeake Health System. UMMS currently owns 49 percent of Upper Chesapeake. UMMS sought this approval even as the system’s debts mounted from the purchase of St. Joseph Hospital and even as it had failed to build a promised hospital on the Eastern Shore. This additional debt was requested after UMMS executives also granted themselves pay raises and bonuses, while laying off employees throughout the state. Click here to read the complete Moody’s report.